Everything you ever wanted to know about cycling in Calgary! 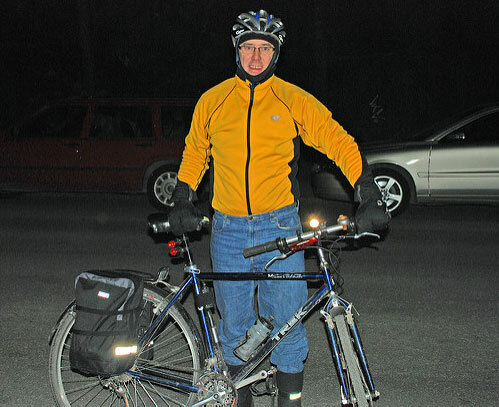 Just because the temperature drops doesn’t mean you can’t still get out and about on your bike. As long as you plan your ride and take a few precautions against the elements there’s no reason to avoid your regular cycling activities. The colder weather can be a bit nasty on your bike. It’s important to give your bike some regular maintenance and a little TLC. When you get home at night pour some warm or hot water over you wheel spokes, chain and gears to remove any built up ice and sand. Washing your whole bike regularly will also help remove road salt and reduce the chance of rusting. Ensure you oil your chain and moving parts regularly. Some riders will invest in a separate bike for winter use which is more suited to the conditions. Hydraulic breaks are preferable as they don’t tend to ice up as much. 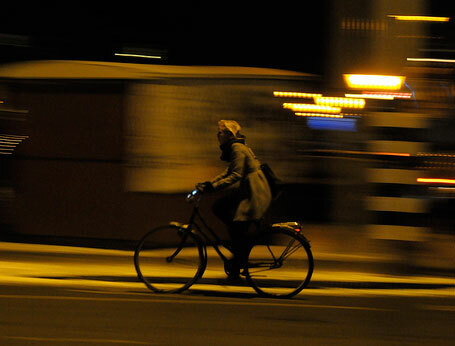 Adequate lighting is a must as the days get shorter in winter and you find yourself riding in the dark. Although you may be able to see with the aid of street lights, that doesn’t mean cars can see you. A blinking tail light is a minimum requirement for cars to be able to easily identify you on the side of the road. If you do require lighting to see where you are going because your transit takes you away from main roads make sure you get one that will do the job. Suitable forward facing lights for illuminating the road ahead should be between 200-400 lumens. Once you have your bike sorted you need to think about your own comfort. Wind and water proof layers are the most important. Although you may be cold when you first step outside, you are going to warm up pretty quickly as soon as your heart rate starts to rise. However you don’t want to arrive at work or school cold and wet from rain or snow. Your extremities will be vulnerable also, especially your hands and fingers. Don’t skimp on a good pair of gloves. They need to keep your hands warm but also be comfortable and supple enough for you to be able to operate your bike and gears easily. A scarf can be multipurpose to keep your neck warm but you can also wrap it around your face to help shield your cheeks and nose from the cold. A good pair of boots and thick socks are also a must. A spare pair of sock for when you arrive at your destination can be handy if you were unfortunate enough to get snow or water in your boots during your ride. Finally you need to think about how you ride. Plan your trip. Avoid roads with less traffic. Busier roads tend to have less snow as the cars help clear it. Also avoid trying to ride on the shoulder as uneven snow is difficult to ride through and you can easily loose balance causing an accident. If you have to ride on the foot path try to follow the tracks of previous riders if there are any. Unspoiled snow is fine to ride through but you’ll have to use more effort. 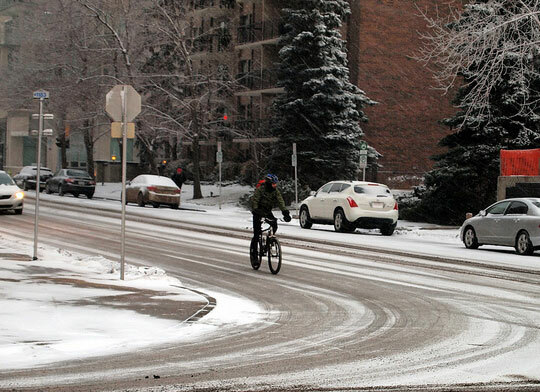 Be aware of ice-slicks and ride with caution. Where snow has melted and then re-frozen these miniature glaciers can be extremely slippery and it can be easy to lose control of your bike going over them. In summary, dress warm, plan your trip and ride to the conditions. 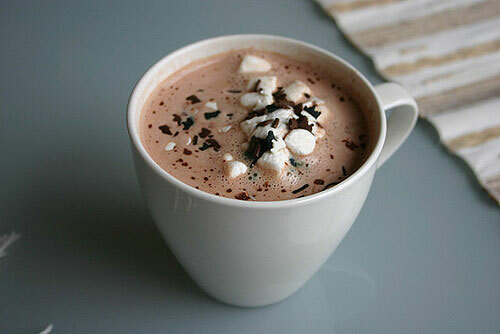 If you leave a little early you can even stop for a hot chocolate before going in to start work for the day!